John began his teaching career in St Joseph’s College all boys Catholic High School (1200 students) in London where he was quickly promoted to KS3 Science Co-ordinator. After 2 years he moved to Sawtry Community College (900 students), a mixed non-denominational high school in Huntingdonshire, as Head of Chemistry and later as Second in Science and Head of Year. After 3 years he moved to an International English School in Kuwait – the Gulf English School (2000 students) – as Head of Science, and became a Senior leader in only his second year. It was in Kuwait that he met his wife. They had both travelled nearly 4,000 miles from home, while their families lived only an hour apart in the UK! He drove from Kuwait to the UK twice in the 6 years he lived there, taking 4-5 weeks to drive across most of the middle east. His many adventures ranged from having automatic rifles pointed at his face whilst travelling along the Jordan-Israeli border, to being invited to swim in sulphur pools with local Syrians in the town of Palmyra… sadly most of which has been destroyed over recent conflicts and tragically so many of the people killed. After the birth of his daughter, the second gulf conflict started and having a new family changed John’s priorities, driving the decision to come back to the UK. On his return he was offered a position at Holywell High School as a classroom teacher and, again, promotion came quickly with his appointment as Head of Chemistry by Christmas, Head of Science at the end of his first year and Assistant Head after 3 years. He completed his MA/MEd over the following years and after being asked to become Acting Head Teacher in January 2014, he completed his NPQH in May 2015. Appointment as the Head Teacher of Ysgol Treffynnon soon followed, in October 2015, and within a few months of accepting that position the school was inspected by Estyn. In his first year as Head Teacher, the school recorded the best academic results in its history and in September 2016 the school moved into the current state-of-the art building, having relinquished the sixth form as part of Flintshire’s modernisation programme. He has just completed his term as Chair of the Flintshire Secondary Head Teachers’ Federation. John’s pride in being the Head Teacher of Ysgol Treffynnon is clearly evident to anyone who meets him. 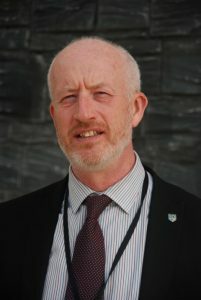 He is totally committed to ensuring that Ysgol Treffynnon earns the reputation of a great school and he and his team will work relentlessly to achieve the vision of ‘Aiming for Excellence’ in everything the school does.